Creating a sense of movement with extended and intersecting erasure lines. 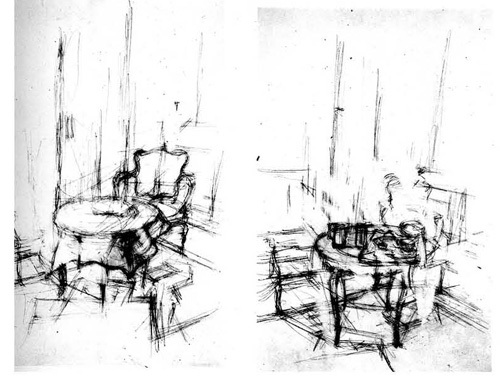 Assignment: Create a drawing of a room articulating the planes of the subject. Extend your lines beyond edges and allow them to intersect. Draw with broad lines that look for edges of planes rather than details. Then, after drawing several times over each line with a dark ebony penicil use a plastic eraser to drag over the line and further extend the marks.